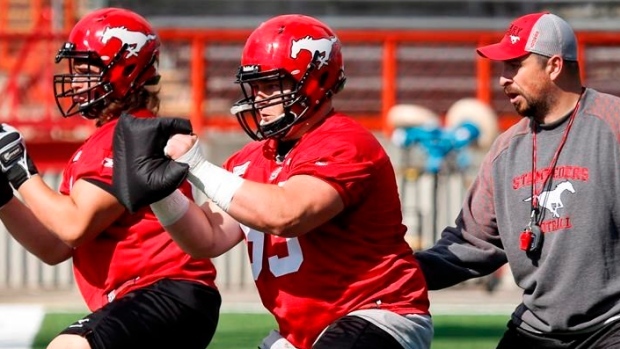 CALGARY — Offensive lineman Pierre Lavertu has announced his retirement from the CFL after four seasons with the Calgary Stampeders. Lavertu was a West Division all-star in 2015, but injuries limited him to eight games in 2016. He was then sidelined for the entire 2017 season because of a high ankle sprain. Lavertu played 41 career regular-season games and three post-season contests for the Stampeders and was a member of Calgary's Grey Cup-winning team in 2014. "Pierre was a force on the offensive line for us when he was on the field and it's very unfortunate that injuries have cut his career short," Stampeders president and general manager John Hufnagel said in a release. "I thank him for his efforts over the past four years and wish him the best in the future." The Quebec City native was the first-overall selection in the 2014 draft after a distinguished career at the Universite de Laval. "I worked hard to return to the field but after consulting with doctors, it was determined that it would not be possible for me to get healthy enough to perform at the level that I expect of myself," said Lavertu. "It's a difficult decision for me to stop playing the game I love, but I will always be a Stampeder."